UPDATE: Robert Torres is no longer employed by TVPD. In March 2014, Treasure Valley Plumbing and Drain Service acquired Lawnkeeper’s Backflow Testing. 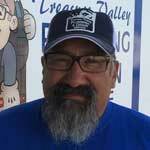 Robert Torres, who was Lawnkeeper’s Backflow Testing Tech, is now doing all the Backflow Testing for TVPD. Robert is from Weiser Idaho where he lives with his wife and children, and works full-time for the City of Weiser. We really appreciate Robert joining us here at TVPD and the great work he’s doing for us. Thanks Robert for being part of our TEAM.